Christine Brown was educated at Gilcomstoun Primary School and the Aberdeen Grammar School. 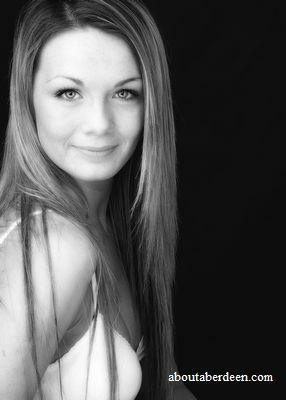 Since she was 17 she has modelled for Aberdeen modelling agency Premier Productions. She was spotted whilst working as a shop assistant in Miss Selfridges in the St Nicholas Shopping Centre in Aberdeen. Her modelling work has included modelling lingerie and dresses for a wedding exhibition and appearing in the Evening Express in various photo shoots. Christine Brown represented our country in the Miss Earth Scotland Competition which took place in the Philippines. On Saturday 25 February 2006 Christine Brown was a contestant in Miss Great Britain. She competed against other models and beautiful girls such as Orlaith McAllister who will be familiar to TV Big Brother fans because she was one of the surprise late entrants to the Big Brother House in Big Brother 6 on Channel 4 television. Sadly Christine did not win, though looked stunning as the photograph to the left shows. The event was held in the Grovenor House Hotel in Mayfair, London. The Miss Great Britain 2006 award went to Danielle Lloyd: Miss Warrington. Runners up were Andrea Clay: Miss St. Helens and Louise White: Miss Basildon. The judges on the panel included TV and Radio celebrity Noel Edmonds, top French chef Jean-Christophe Novelli, Jenni Falconer the presenter from GMTV, footballer Teddy Sheringham, Faria Alam from Celebrity Big Brother 4 and celebrity Christine Hamilton. In 2005 she was awarded the title of Miss Aberdeen. Her height is 5 feet and 10 inches. Christine Brown now lives in Sheffield England with her boyfriend Tai Mir where she is able to secure more work as a model. This includes working for the model agency Storm. More famous Aberdonians and more models from Aberdeen.